The Opening Statement by the Right Honorable K.P. Sharma Oli, Prime Minister of Nepal at the Inaugural Session of the Fourth BIMSTEC Summit Kathmandu, 30th August 2018. Welcome to the land of Buddha and Sagarmatha! Welcome to the land of peace and harmony! The Government and people of Nepal feel truly honored and privileged to warmly welcome the distinguished Heads of State and Government and other delegates to the Fourth BIMSTEC Summit in Kathmandu. I sincerely thank you, all the fellow BIMSTEC leaders, for the prompt consent to host this Summit within such a short span of time and for your gracious presence here today. I wish you all a pleasant stay in Kathmandu. The world is watching our gathering here today with keen interest. Because, as a region with 1.6 billion people, representing 22 percent of world population and combined GDP of US dollar 2.8 trillion, our vision, commitment and action will have an impact on global political and economic order. Against this backdrop, we have assembled here with a solemn commitment to making the Bay of Bengal region peaceful, prosperous and sustainable. Our countries, together, have a dynamic potential–imbued with the creative ingenuity and diligence of our peoples; opulence and generosity of the nature; richness and depth of the civilizations; and magnificence of diverse cultures and heritages. And this unique platform of BIMSTEC, not only connects our countries; it also connects South Asia with South-East Asia. And, it connects mountains with oceans, reinforcing ecological interdependence. It brings together a resolve of our leaderships- a resolve for progress and prosperity; and for sustainable development. BIMSTEC is not just a sum of its parts- or a sum of the Member States. It is more than that. It is also an Idea. An idea that deeper integration can unleash the economic dynamism and address the development needs of countries and peoples, and an idea to accelerate social progress and promote collaboration and partnership. It can be also an Identity- an identity rooted in rich civilizational heritage, an identity founded on shared values, an identity shaped by common understanding, and an identity based on the unity in diversity. It is also a Destiny- a destiny ordained by the organic linkage of ecosystem between high mountains and deep seas, a destiny shaped by contiguous geography as well as potential of robust people-to-people contacts. Above all, it is our Commitment- a commitment for deeper integration of our economies, of our trade and commerce. It is a commitment espoused over two decades ago, as a thoughtful response to seize the opportunities of globalization and shifting of economic locus to Asia. And, I must say- it also has to evolve as a cohesive regional grouping; an association of connected countries, connected societies and connected peoples. Our group, together, has a promising potential –with a plethora of opportunities; with rich natural resources, and dynamic and vibrant populations. Moreover, we have been blessed by the wisdom, knowledge and innovation of our ancestors. In realizing our potentials, first and foremost, we must liberate our people from the clutches of poverty- the brutal clutches that drag us in a vicious cycle of deprivation -inhumane, unjust and malign- that drains our potential and ridicule our efforts as well as intentions. The dexterity of our hardworking people cannot pay off if we fail to lift millions of people from the suffocating ditch of poverty. The dream of prosperity falters if we fail to defeat the darkness of poverty. The BIMSTEC Poverty Plan of Action must be fully implemented. We must build on the progress made in the implementation of Millennium Development Goals and integrate the transformative 2030 Agenda for Sustainable Development. We must ensure that in accelerating the economic development no one is left behind. We have been bearing the heavy brunt of nature’s fury. Disproportionate consequences of climate change have adversely impacted us. Calamities such as landslides and floods have caused colossal loss. Ironically, we are being penalized for the mistakes we never made. To face this challenge, what we need is collective preparedness to prevent the perils of such calamities. We also need to intensify collaboration to adapt to and mitigate the menace of climate change based on the Principle of Common but Differentiated Responsibility and Respective Capabilities. We are in the lap of the same Himalayas. Our rivers originate from the Himalayas and merge in the Bay of Bengal. The clouds from the Bay of Bengal bump against the Himalayas and land in our country in the form of ice and rain. The typhoons in Bay of Bengal shake the Himalayas, and trigger avalanches and floods. Avalanches and floods in high mountains, in return, create troubles of various kinds in Bangladesh and other coastal areas. The nature has not just created the Himalayas and the Bay of Bengal, but also the bond of existence, one that requires us to constantly collaborate and cooperate. With the wave of fourth industrial revolution, new avenues have opened up. The technological revolution is transformative. Old modes of production and consumption are being transformed exponentially. This phenomenon has presented us a wide menu of challenges as well as opportunities. And, complacence is not in the menu. We cannot afford to be the mere bystander at our own peril. We need to invest more in information and communication technology. And, we need to invest smartly. Most importantly, we need to invest in our youths- to inculcate entrepreneurial spirit in them; to nourish their creativity; to spur the innovation; and to impart skills to them, befitting the rapid technological change. It will contribute to unleash their vigor and energy for creativity and production, thus barring the desperation and vulnerability. We should strive to best utilize the energy of our youths. Our youths and children are our future. We have to work together for youths and children and for the future generations. Investment in youths and children is investment for prosperous future. Our region is not immune from dangers of terrorism, organized crimes, drugs trafficking, human trafficking, and money laundering, among others. We must remain united in defeating terrorism in all its forms and manifestations. We must combat all other transnational organized crimes through an enhanced level of cooperation and coordinated efforts. Peace and stability is essential for sustained economic growth and development. And, I believe that faster development with social justice and the rapid growth with equitable distribution are key to ensuring peace and stability. Trade is an engine for economic growth. It is unfortunate that we trade little within the region. An early conclusion of the agreements on trade in goods, trade in services, investment, mutual assistance in customs matters, dispute settlement and trade facilitation is the need of hour to enable BIMSTEC to effectively move forward. When the protectionist tendencies and increasing barriers are rife in the world, increased understanding among us is a sine qua non to realize our commitments for free and fair trade. Our success will depend on the honest and time-bound implementation of all the instruments that we have signed. Our success will depend on lesser barriers and greater trade facilitations; on smooth and uninterrupted transit arrangements; on increased flow of goods and services; and on scaling up of investments. Our success will depend on integrated markets, integrated economies and an atmosphere of confidence for level playing field for all the Member States, including the landlocked and least developed countries amongst us. My Government has adopted the long-term goal of “Prosperous Nepal, Happy Nepali”. When we speak of prosperity and happiness; we must be aware -the nexus between opulence and happiness is not linear. Prosperity alone is not the soul and face of happiness. Happiness is multifaceted. It has multiple building blocks. And prosperity is one of them. 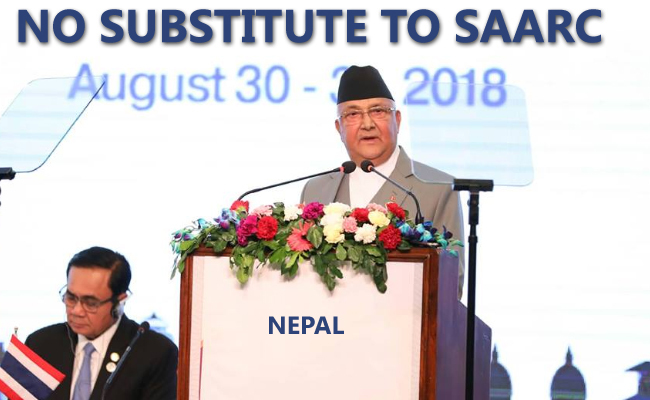 Decent jobs and gainful employment for working population, modernization of agriculture, utilization of energy potentials in particular hydro-power, infrastructure development, tourism and development of human resources are among the priorities to achieve the goal of ‘Prosperous Nepal, Happy Nepali’. In our efforts to realize this goal, we count on the goodwill and support of the international community. As I emphasize the importance of cooperation, we must take note of the simmering uncertainties in multilateralism. We must collectively make a resolve to preserve and maintain multilateralism as the most legitimate process for addressing contemporary challenges of global scale. All States- bigger or smaller- must fulfil their responsibilities in good faith and ensure that the principles of fairness and justice are upheld. We want to achieve the goal of prosperity and happiness within a democratic framework established by our constitution and on the strengths of uniquely successful peace process. Our commitment to democracy, human rights, good governance, rule of law, and social justice is total and unwavering. We believe in comprehensive democracy that empowers individuals not only politically but also economically, socially and culturally. Guided by the similar vision, we also aspire for a “Prosperous Region, and Happy Peoples”. And, we must remember –any pockets of deprivation –whether small or large; any impulse of exclusion; and perennial attitude of pessimism and cynicism are obstacles in the march towards the vision of prosperous region and happy peoples. We will be able to overcome these obstacles only through deeper economic integration. For this, we need to identify the drivers of economic integration. Better physical connectivity, increased trade, and enhanced people-to-people contacts are some of them. We need to do this by focusing on our commonalities as well as comparative advantages. We need to do this by taking bold policy measures. Connectivity is a key enabler for robust regional cooperation. It is the very foundation, in which the edifice of economic integration can stand upright. Connectivity-in physical and digital sphere; connectivity of infrastructures and industries; connectivity of markets and minds can unleash multiplier effects igniting innovation; spurring growth; and propelling progress. We need to intensify our investments in the cross-regional transport networks. Better connectivity of roads, railways, airways, waterways will unlock our full potential. It can promote meaningful cooperation in trade and investment, energy, tourism and technology transfer. An early adoption of the draft BIMSTEC Master Plan on Transport Connectivity and timely conclusion of transport related regional instruments will help advance our cooperation in this critical area. People are the drivers and beneficiaries of connectivity. Buddhism serves as a strong connecting thread in the region. All the Member States of BIMSTEC are connected with Buddhism in one way or the other. It is in this spirit and as the Prime Minister of a country that gave birth to Buddha, I underline the importance of developing and operationalizing a Buddhist Circuit in the region to promote connectivity and tourism. The success of BIMSTEC will be judged by outcomes it delivers. A strong political will coupled with right mix of policies, institutions and resources can ensure the success of BIMSTEC. As our organization evolves, we should be prepared to adopt a Charter to provide it a solid legal foundation. I welcome the appointment of Ambassador Mr. M. Shahidul Islam of Bangladesh as the Secretary General of BIMSTEC and wish him a successful tenure. The Secretariat must be strengthened to fulfil its responsibilities. Nepal stands for meaningful regional cooperation. We believe that SAARC and BIMSTEC do not substitute but complement each other. We are also committed to advancing the sub-regional cooperation under BBIN. Before I conclude, let me reiterate Nepal’s strong and unwavering commitment to the process of regional cooperation under BIMSTEC.